Disco Dean Karns, Jr. of Fairborn celebrates with his family and friends after winning the $20,000 event at the Liberty Classic drag race, presented by Vintage, June 29 at Kil-Kare Dragway. Kil-Kare hosted three $20,000-to-win events over the weekend. XENIA — Maybe Disco Dean Karns Jr. should take a day off every weekend. Karns Jr. sat out Friday’s first $20,000-to-win drag racing event, opting to have Toledo friend Brian Lampton get behind the wheel of the Pink Taco dragster for the first of the three-race Flatout Gaskets Liberty Classic, presented by Vintage Trailers, June 30-July 1 at Kil-Kare Dragway. Whether Lampton shook the car down just right, or whether Karns Jr. just found a groove of his own, the veteran Fairborn drag racer went out and won Saturday’s $20,000 event. One hundred and eighty three big-money racers competed in Saturday’s event, with Disco Dean dancing away with the first-place win. In the ninth and final round of Saturday’s eliminations against Warren’s Marco Abruzzi, Karns got off the starting line with a quicker reaction time (0.0141 seconds to Abruzzi’s 0.0249), and came closer to his dial-in time (4.5515 seconds with a 4.44 dial-in, to Abruzzi’s 4.8756 on a 4.87 dial-in) to earn the win. Cameron Adkins won the $20,000 prize in Friday’s first race, and multiple IHRA World Champion Kenny Underwood claimed the Sunday event win. 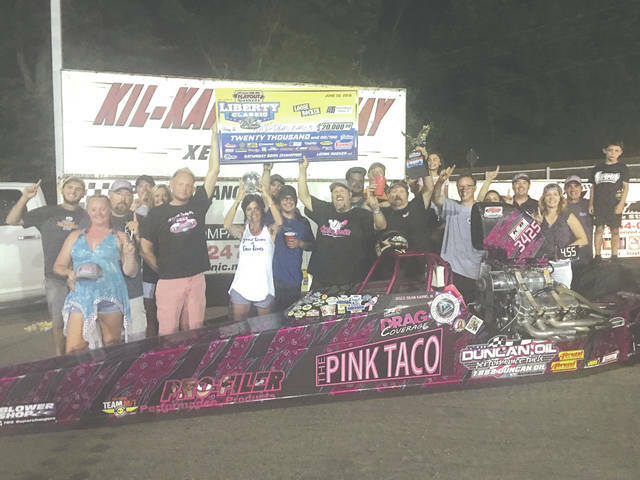 Karns and several other big-money drag racers will return to Kil-Kare, Friday and Saturday July 6-7 for the Eat Race Die All American No Prep and Prepped racing weekend. Several drag racing stars from Discovery Channel’s Street Outlaws television series, including Enon native Tom Murillo and Dayton’s Scott Taylor, will be on hand for the $5,000-to-win event. No prep will be done to the racing surface for Friday’s $5,000 event. Several classes of racing, including a kids Power Wheels drag race, is on the schedule for Saturday’s prepped track event. https://www.fairborndailyherald.com/wp-content/uploads/sites/50/2018/07/web1_KarnsWinner_PS-1.jpgDisco Dean Karns, Jr. of Fairborn celebrates with his family and friends after winning the $20,000 event at the Liberty Classic drag race, presented by Vintage, June 29 at Kil-Kare Dragway. Kil-Kare hosted three $20,000-to-win events over the weekend. Submitted photo.